New York Cheesecakes are creamy, and smooth, and rich, and dense, and absolutely delicious. This cheesecake has three layers, starting with a graham cracker crumb crust that is topped with a cream cheese filling, and then a layer of lightly sweetened sour cream. 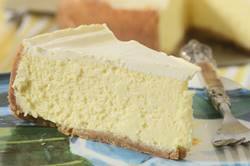 There are two popular cheesecakes in America today, the ones made with cream cheese (shown here) and the ones made with ricotta. John Mariani tells us in his The Dictionary of American Food & Drink that Americans have come to know cheesecakes made with cream cheese as 'New York' or 'Jewish' Cheesecakes, and ones made with ricotta as 'Italian' Cheesecakes, with both types having their roots in immigrant New York City neighborhoods. We start this recipe by making the Graham Cracker crust which is, by far, the simplest of all the pie crusts. Now, if you have problems with getting the right crust consistency, the test to see if you have the right amount of crumbs to melted butter is, once you have mixed the ingredients together, to squeeze some in your fist. If the crumbs hold together, you have the perfect crust. Once the crust is made and pressed into the tart pan, it is left to chill in the refrigerator. If you would prefer a firmer crust, instead of chilling you can bake the crust in a 350 degrees F (177 degree C) oven for about 10 minutes. The next step is to simply mix the filling ingredients together. Make sure to use full fat cream cheese and have it, as well as the eggs and cream, at room temperature. We cannot talk about cheesecakes without mentioning the pitfalls, mainly the questions of how do we prevent cracking and when are cheesecakes done? First, let's talk about cracks on the surface of a baked cheesecake, as this is a common problem and is caused either by over beating the batter and/or by too much moisture being lost as the cheesecake bakes (over baking). In order to prevent cracks make sure you beat the ingredients at low speed as, unlike a butter cake, you do not want to incorporate a lot of air into the batter, you only want to beat the ingredients until they are nice and smooth. As far as the over baking of cheesecakes goes, this is a common problem as it is difficult to know when a cheesecake is done. The thing to remember is that you want the cheesecake to be firm but, if you shake the pan gently, it should still wobble a little, and the center will still look a little wet. For even though the center may not look fully baked, once it cools it will firm up and be the correct consistency. Cheesecakes are cakes that should not to be eaten straight away as they need to cool and then be refrigerated for several hours, preferably overnight, so the flavors have time to blend and the texture becomes nice and firm. The great thing about cheesecake is that it stores very well and can also be frozen. To freeze, place the cooled cheesecake on a baking pan and freeze, uncovered, until firm. Remove the cheesecake from the freezer, wrap it in heavy duty aluminum foil and place in a freezer bag. Seal and return to freezer. It can be frozen for several months. Thaw the uncovered cheesecake in the refrigerator overnight. New York Cheesecake: Grease, or spray with Pam, a 9 inch (23 cm) springform pan. Place the springform pan on a larger baking pan to catch any leakage while the cheesecake is baking. Preheat oven to 350 degrees F (177 degrees C) with rack in center of oven. For Crust: In a medium sized bowl combine the graham cracker crumbs, sugar, and melted butter. Press the crumbs evenly over the bottom and about 1 inch (2.5 cm) up the sides of the springform pan. Cover and refrigerate while you make the filling. For Filling: In bowl of your electric mixer place the cream cheese, sugar, and flour. Beat on medium speed until smooth (about 2 minutes), scraping down the bowl as needed. Add the eggs, one at a time, beating well (about 30 seconds) after each addition. Scrape down the sides of the bowl. Add the whipping cream, lemon zest, vanilla extract and beat until incorporated. Remove the crust from the refrigerator and pour in the filling. Place the cheesecake pan on a larger baking pan and place in the oven. Bake for 15 minutes and then lower the oven temperature to 250 degrees F (120 degrees C) and continue to bake for about another 60 - 90 minutes or until firm and only the center of the cheesecake looks a little wet and wobbly. (The baking time can vary due to the differences in ovens, so make sure to check that the cheesecake is firm with only the center being a little wet and wobbly.) Remove from oven and place on a wire rack. Makes one - 9 inch (23 cm) cheesecake. To freeze: Place the cooled cheesecake on a baking pan and freeze, uncovered, until firm. Then wrap in aluminum foil and place in a freezer bag. Seal and return to freezer. Can be frozen for several months. Thaw uncovered cheesecake in the refrigerator overnight. Tips: Sometimes the surface of the cheesecake cracks. To help prevent this from happening do not over beat the batter, especially when creaming the cheese and sugar. Another reason for cracking is overbaking the cheesecake. Your cheesecake is done when it is firm but the middle may still look a little wet. Also, make sure the springform pan is well greased as cracking can occur if the cheesecake sticks to the sides as it cools.